Symptoms: Machine wouldn’t boot and had switch matrix problems once it did boot. The pinball machine didn’t boot due to some oxidation on the ROM pins. I removed the game ROM from the MPU and cleaned with contact cleaner. Once the game booted, there were solenoids firing in attract mode which usually indicates that there are some switch matrix problems. The diagnostics revealed that many of the opto switches were not working. On many Williams machines of this era, there is a board mounted under the playfield that provides an interface between the optical switches and the switch matrix. In the case of Indiana Jones, it’s labeled “10 Sw PCB”, which will interface up to 10 optical switches. I began to take some voltage measurements on this board and nothing was correct. 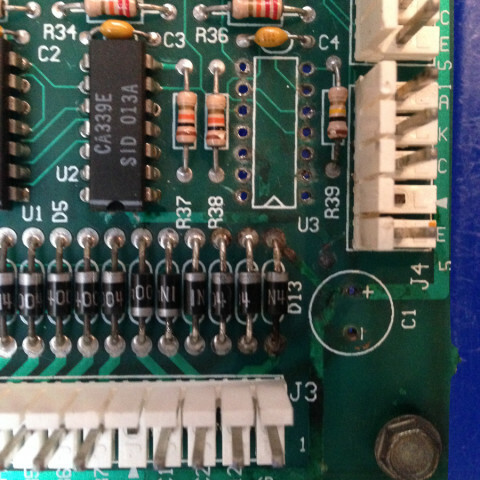 Upon closer examination, something acidic had dripped on the board and, just like battery alkaline, had eaten through the circuit board traces. At first I couldn’t find the source of this acid, but eventually figured out it was from the electrolytic capacitor (C1) that was also located on the board. Capacitor C1 had leaked, damaging the area around D13 and U3. I cleaned up the board and replaced C1 and U3. I had to re-wire some of the circuit traces since some no longer had continuity. I reconnected the board and switch matrix worked fine. In testing the machine, I found a blown fuse associated with the flash bulbs. I replaced the fuse and checked the flasher sockets and found a frayed wire that probably had caused the fuse to blow. This same customer also had a The Machine: Bride of PinBot (Williams, 1991) that he wanted me to take a look at. The first thing I noticed was that the lights weren’t sequencing properly around the “helmet”, plus some of the bulbs appeared to be out. After tracing signals to the Chase Light interface board, I found some wiring errors that were probably made at the factory. And the problems with non-working bulbs was related to connection issues. Once repaired, the lights sequenced properly around the helmet. When playing the game I noticed the slingshots were making the sound like they were firing, but they weren’t actually kicking the ball. A peak under the playfield revealed that both plunger/link assemblies were broken. Broken links associated with slingshots. 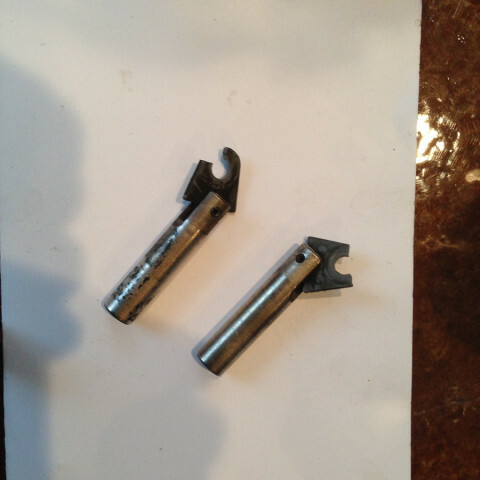 I replaced both of those plunger/link assemblies and the machine played well. I’d like to note that I stock a lot of parts so that I don’t have to make multiple trips to a customer’s location. While I can’t stock an entire warehouse, I had all of the parts on-hand to repair both of these machines, including the circuit board, in a single visit. Symptoms: Left flipper not working. In Williams pinball machines of this vintage, the flippers are driven by the solid-state Fliptronics II board, which is located in the backbox in the upper left. There are 4 fuses, one for each possible flipper in the game: upper right, upper left, lower right, lower left (F901 – F904 respectively, each of which are 3 amp, slow-blow). In the case of many Williams machines, there are less than 4 flippers. If your game only has two flippers, you have 2 spare fuses available if you’re in a pinch. In the case of Indiana Jones, there are only 2 flippers. When I was first contacted by the customer, I told him to check F904 which is labeled for the lower left flipper. He went ahead and replaced it, but it didn’t solve the problem. So, I paid the machine a visit. I determined that the flippers in this machine are wired to the upper flipper outputs, therefore F902 was the culprit. I vaguely recall running into this somewhere else. Maybe that’s why it’s called The Pinball Adventure. So, if you have a Fliptronics machine and you have a non-working flipper, check both upper and lower fuses. By the way, the fuses are arranged on the circuit board in the same way the flippers are arranged on the playfield: upper left fuse is the upper left flipper, etc. Symptom: When starting game, 6 balls would eject into shooter lane. Obviously, there was a problem with the ball trough optical sensors. Upon closer examination, there was no +12V supply voltage on either the IR emitter side of the trough or the receiver side. To the backbox we go. 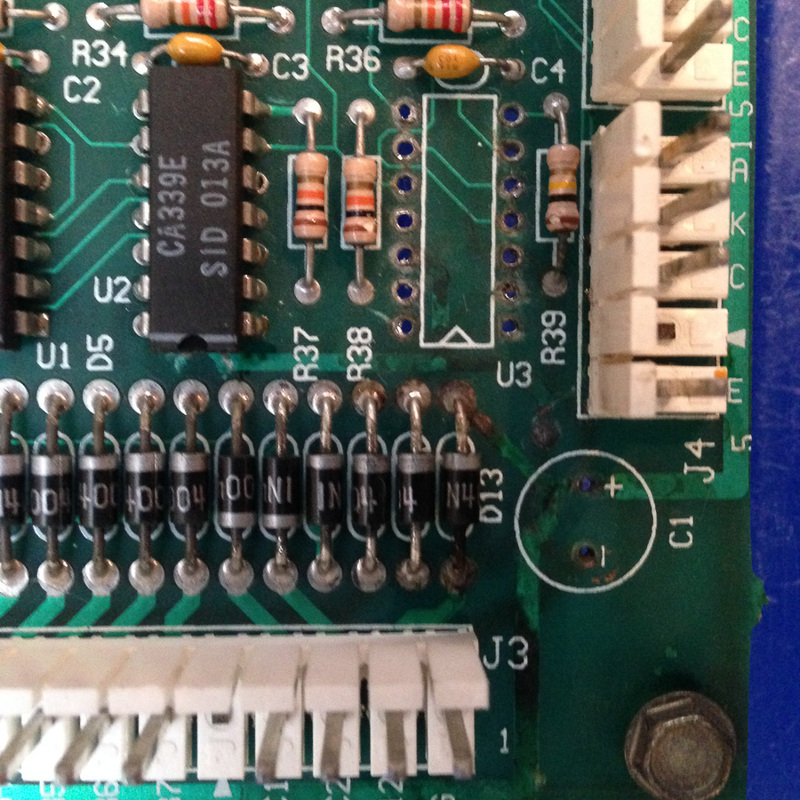 The +12V for misc playfield sensors comes off the lower left of the Power Driver board. There are several 4 pin connectors located there (J116, J117, and J118). All of the connectors looked good. I checked the +12V there and it was still missing. Fuse F116 was blown, which supplies the 12 VAC to the rectifier, which generates the DC version of the voltage.